This was said poetically many years ago. We need to love in ways that will be received. Having a variety of ways from which to choose is helpful. Love is positive and affirming. Love is creative and helpful. Love is a natural flow of life-giving energy. Love is respectful and kind. Love is peaceful and happy. Love is good and beautiful. Simple Natural Ways to Love. Make a comment of appreciation. Let the other know they are seen. Send a personal handwritten note. Make someone their favorite food. Make an unexpected phone call or visit. Greet another with real delight and pleasure. Tell another what you appreciate in them. Forgive their errors or omission or commission instantly. Give your best in every encounter or conversation. Create a loving evening or event together. Surprise them with sincere words in a card, song or sharing. Think of the other always with happiness and love in your heart. Vow never to stop loving them, no matter what may occur. Write a poem, song or letter of tribute and gratitude. Speak only the most positive words about them to others. Look for opportunities to serve them in uplifting and helpful ways. Reach out and give a smile and a hug for no special reason. Say “I Love you.” when the other needs to hear it. Love is our Source of life energy. Love is our happiness expressed outward. Love is healing, creative, reassuring and helpful. Let’s remember to love one another, as well as ourselves today and everyday. Here is a gift of love for you. It will make you smile. 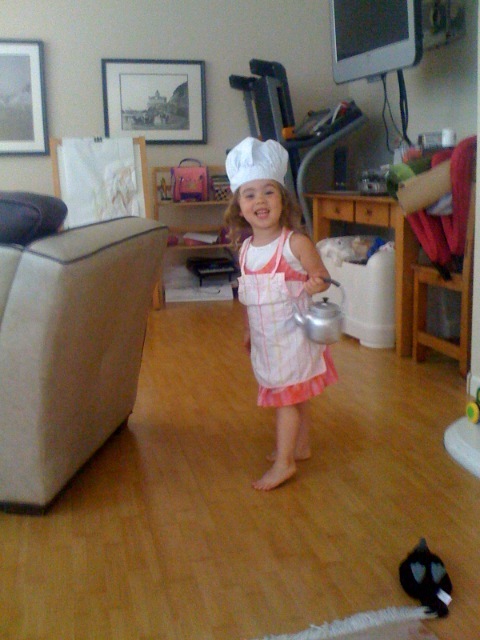 Chef Sofia is our 2 1/2 yr. old granddaughter, and Gia’s little sister.